The earliest organized church in Geneva is the First Baptist Church of Geneva, first called the Lake Harney Baptist Church. The Church was organized on August 15, 1875 with 10 members and Reverend George Cader Powell as Pastor. Reverend Powell traveled up the St. Johns River from Jacksonville with his wife and 2 of his daughters in a hand hewn dugout canoe. He was the grandfather of Mrs. Helen Alderman and the great-grandfather of Mr. Cader Hart. When the church was first organized, 17 Articles of Faith were drawn up and approved by the members. Services were initially held in the homes of the church members. On July 24, 1880 a committee was appointed to erect a house of worship just west of the present cemetery on land donated by Mr. Debogory. In September 1880 Reverend R.W. Lawton of Oviedo was called as Pastor. The church was completed and dedicated on June 17,1882. The following June, Reverend Lawton resigned and on September 15, 1883 Reverend S.F. Quire was selected as pastor. In October of 1883 W.B. Lassiter was ordained as Deacon. He remained with the church until 1886. Reverend T.J. Bell served as pastor from 1886 until 1888 when Reverend Lawton was again elected pastor. The name, Lake Harney Baptist Church, was changed to Geneva Baptist Church on August 1, 1890. During these early years the pastors were paid only by voluntary donations, frequently amounting to less than $3.00. Church records show that the church became inactive on 13 October 1901. After the period of inactivity, the Baptists of Geneva met at the home of Reverend George H. Sieg in 1908. Rev. Sieg was from Americus, Georgia and the father of Mr. W.L. Sieg and Mrs. Kittie Wells Allen. Reverend Sieg began to hold services again once each month in the building located adjacent to the cemetery. Mrs. J.N. Worthy, Mr. and Mrs. I.D. Hart, Mr. and Mrs. David Speer and Ms. Pearl Worthy. G.H. Sieg and J.A. Worthy were elected deacons, I.D. Hart was elected treasurer, J.N. Worthy and David Speer were elected trustees, Joe L. Sieg was chosen church clerk, and Pearl Worthy, organist. Reverend E. Lee Smith was called as pastor in March of 1909. Clerk records are not available for the period 1914-1926. At sometime during this period the church building was moved from the cemetery to a location northeast of the Elementary School. In October of 1926 the church decided to check into the possibility of purchasing the clubhouse of the Woman’s Club of Geneva’s for use as a church building. This building was located just east of the present Children’s Education Building. The woman’s club agreed to sell the building for $3,500.00. The church started accepting donations in November of 1926. By January of 1927, $1,384.00 had been collected and the church gave the trustees authority to complete the transaction. It appears that the purchase was completed and first service held in late January of 1927. Then tragedy struck! The following Friday night after the first church service was held the just purchased building burned to the ground! As the old church building had been sold to the Oak Grove ME Church on Old 100 and had been moved, the congregation, having no building in which to hold services, met under the trees at the present location of the old wooden church for several services. The Methodist Church and the Geneva School offered their buildings for services, which was gratefully accepted. Reverend J.M. DeVette, who was the pastor at the time, built the new church on 1st Street. Although not completely finished, the congregation moved into the wooden church on July 17, 1927. In the early days, church services were held only twice monthly, with the Methodist Church conducting services one Sunday and the Baptist Church the next. Finally, in 1927, Reverend J.M. DeVette became the first Baptist full-time minister; however, the church was unable to raise his salary so the church went back to twice monthly services in 1928. The alternating church services continued until 1947 when a ministerial student at Stetson University in Deland, Julian Stenstrom, conducted services 2 Sundays per month and also taught the Adult Sunday School Class each Sunday. In 1950 Leo D. Barnes became the full-time pastor and the church has had a pastor full time ever since. On 2 March 1952 the church voted to build a pastorium with Cader Hart as the building chairman. Mr. and Mrs. Walker Prevatt loaned the church $3,000 to build the pastorium. 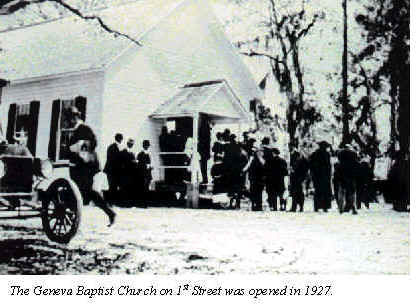 On May 1, 1955, the name of the Geneva Baptist Church was changed to the First Baptist Church of Geneva. Reverend R.G. Key accepted a call from the church in July 1965. The Children’s Educational Building was constructed while he was the pastor with Reverend Key overseeing the work and purchasing most of the materials. The building was completed and dedicated on 29 May 1966. A Special rapport has always existed between the First Baptist Church and the First United Methodist Church. The 2 churches combined choirs to sing Christmas carols throughout the community with the churches alternating host duties. Several years ago these churches also began alternating the planning and conducting of the Easter Sunrise Service and in 1974 the Church of the Nazarene joined in the Service which is always held on "Summersill’s Hill", where the 3 crosses stand, overlooking Lake Geneva. In August 1975, the 100th Anniversary of the Church was well published and well attended with members in early costumes and in 1981 Mrs. Dolly Braddy and her son Wendel Braddy loaned the Church $6500, interest free, to purchase 13.26 acres where the new church now stands. Groundbreaking for the new church was held July 15, 1984. Everyone was most proud when the dedication was held on April 7, 1985. Note: A more complete history of the church can be found at the First Baptist Church of Geneva and also in the Geneva Historical Society's museum. Home Page Genealogy The Society Museum Books, T-Shirts,etc.